Fabulous new home in "The Cottages", a lovely selection of hillside Craftsman style homes. 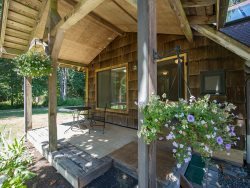 This Cottage features maple floors (no shoes please), siltstone counters, propane fireplace and top of the line finishes for your retreat to Sequim. French doors lead from the dining area to the patio with views of the surrounding meadows. On a clear day you will see Protection Island, the Strait of Juan De Fuca, and Mount Baker. The kitchen is a gourmet's dream. It is well stocked and open to the living area so you can be part of the fun. We have thought of everything from high speed internet, CD/IPOD player, 32-inch LCD/HDTV, DVDs, and games in our den, to down comforters, 600 thread count sheets, and over sized bath towels to keep you cozy. Gas grill on patio. Our master suite includes a king sleep number bed (you can choose your own number! ), double sinks and a separate "private" area. We have a queen sleep number bed in the guest room with the second bathroom just outside the door. We do have two queen aero beds to use when necessary. Theater room features wall mounted TV and couch with two recliners. Bonne Chance has excellent access to the Olympic National Park, Victoria ferries and to Port Townsend. Minutes to shopping and entertainment in both Sequim and Port Angeles. Note: This is a lovely planned community. As such, guest parking is limited to the driveway: 2 standard vehicles or 1 large SUV in driveway. No parking allowed on the street. Very Nice! New, nice, nice neighborhood, clean, well equipped, well kept, well located.